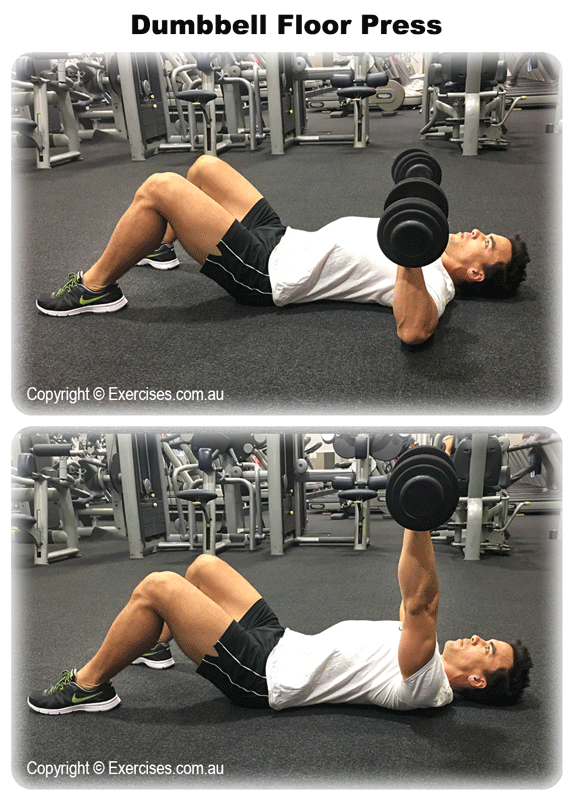 Dumbbell Floor Press targets the triceps and the upper, middle area of the chest without putting the shoulders in any dangerous positions. With the Dumbbell Floor Press, you are able to hit your upper chest more because the wrist is able to rotate inward to a more natural position. Sit on the floor and keep your legs straightened out. Place one dumbbell on an upright position between your legs. Using both hands bring the dumbbell to the top part of your left thigh. Have someone place the second dumbbell on the top part of your right thigh. Lie on the floor and shrug your shoulders back and up. Keep your shoulder blades pinned on the floor. With your elbows firmly on the floor, slightly rotate your wrist inward to a more natural position. Bring the dumbbells slowly back to start position. When your elbows have touched the floor, hold for a count of “one” before pressing up. To place the weights down safely, at the lock out position, rock your momentum onto your thoracic spine then rock forward as if doing a sit up. 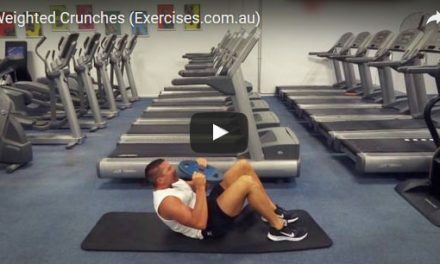 Another way is to bring the dumbbells to your chest, ask a spotter to remove one dumbbell then roll to the other side and allow the dumbbell to roll off. Dumbbell Floor Press is a great way to add mass to your triceps and upper chest but because of the lack of stability, it is safer to use moderately heavy weights. Allow the wrist to naturally rotate inward to lessens tension on the wrists and keep your elbows tucked in at all times.